1. It's really only a matter of opinion that the objective of Hamas is the slaughter of Jews, the destruction of Israel, and the imposition of a religious dictatorship of strict Sharia. Unfortunately, it's Hamas' opinion. 2. Allies of Hamas -- e.g. Iran's President Ahmadenijad -- have called for the elimination of Israel, and have provided heavy weapons to Hezbollah and would no doubt do the same for Hamas, were they able. Given these two points, it would make no sense at all for the Israelis to allow ships manned by Hamas' supporters to sail freely to Gaza; it would be suicidal. If the blockade of Gaza is eliminated while Hamas is still in power, can there be any doubt about what sort of things will flow into Gaza? Gaza will become a forward firebase for Iranian missiles such as these. Place accurate missiles in the hands of sociopaths like Hamas, and previous Arab-Israeli conflicts will look like picnics. In my view, had the IDF simply sunk the flotilla it would have been justified. (Not a good idea, please note, but still justified.) One must be utterly ignorant of what's going on to not understand this is about destroying Israel. There will be enormous outrage around the world over the Israeli interception of the flotilla, far more than over the North Koreans' murderous sinking of the Cheonan. (Outside of South Korea, has there been any reaction at all?) We're living in mad times, when naked evil is defended as good, and self defense is condemned. When I spoke in a previous post of a new American Revolution, I had in mind the same sort of intellectual revolution that preceded America's War of Independence -- one which affirms the inviolability of individual rights, as opposed to the current fixation on collectivist "human rights." Individual rights include the right to defend oneself against annihilation. Individual rights do not include the right to take strategic action on behalf of a homicidal organization like Hamas. The distinction ought to be clear. I'm in the midst of travels -- but want to make a quick endorsement of Israel's interception of the Hamas flotilla. So long as Gaza is ruled by Hamas, an organization that explicitly calls for the physical destruction of Israel and the annihilation of Jews, the blockade should stay in place. If the Israelis open Gaza, they will have long range missiles on their southern border in no time. The western leftists and Islamists making common cause in this flotilla are enemies of liberty. I wanted to suggest that if they are really humanitarians worried about the plight of trapped people, they set sail for North Korea. But its obvious they do not give a whit for victims of dictatorial oppression -- otherwise they'd be appealing to Hamas to stop oppressing Palestinians in Gaza. The purpose of the flotilla is simply war on Israel. For a good summary of the Hamas Flotilla story, see this. The greatest contributors to the fiscal unsustainability of the U.S. federal government are its health care programs. The recent "fixes" passed by Congress do nothing to improve this and under any realistic analysis actually make the situation much worse. Growing health care costs are also -- obviously -- a major concern for those of us who pay for own own health care. Suppose there was a way to improve health care by an order of magnitude, and at the same time make it less expensive, so much so that we might even reduce expenditures. Such a development would contribute enormously to individual human well-being, and would help solve our worldwide fiscal crises. Well, such a development is not only well under way, it is about to be implemented for the first time. The development is 4P Medicine™, and it is about to be tested in a collaboration between the Institute for Systems Biology and Ohio State University, which will use it in providing health care to its 55,000 employees. 4P Medicine™ (yes, it's trademarked) stands for Predictive, Preventive, Personalized, and Participatory, and combines breakthroughs in genetics, computing, and mathematics to develop a completely new approach to medicine. Using an individual's genetic information, the 4P approach will predict problems years before they begin, and suggest approaches to prevent them from ever occurring. "Proactive" could easily be another "P" in list. My description here doesn't do it justice...check out the links. It reads like science fiction, but it is here today. In many sectors, technological advance tends to reduce expenses; in health care technological advance has (allegedly) tended to increase them. (I am uncertain why developing a new but expensive life-saving technique is considered cost-increasing, if we are figuring costs properly -- but that's a topic for another post.) 4P Medicine has the potential to reverse this. I have little hope that governments are going to become fiscally responsible or that they'll begin getting out of the way of entrepreneurs and innovators who could actually solve the problems we face. These are simply not in the personal interests of politicians and bureaucrats. My hope is that innovation will simply advance civilization faster than state action dismantles it. The development of 4P Medicine is an example of how this can happen, and why I am still optimistic about our future. There's an excellent half-hour interview with Dr. Leroy Hood, the man behind 4P Medicine, available here on Yellowstone Public Radio. I highly recommend it! 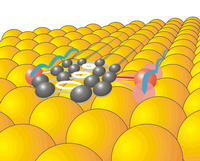 The accompanying picture is a "walking" molecule, a development that has potential application in nano-computing. It has no direct connection to story, but it at least adds a bit of color to the page. And it certainly isn't unrelated. From the What's Next? blog http://www.whatsnextnetwork.com/technology/ (doesn't like links). I'll have some good news to post soon... No, not the usual heartwarming human interest story sort of good news, but news about how civilization might yet outrun the efforts of the statists to corral it. Just waiting for the link to appear... stay tuned. Are “we” off our rockers? The most recent posts on Unforeseen Contingencies have suggested that America is sliding into fascism. Our readers seem to have doubts, and frankly I understand – posting this sort of commentary bothers me a great deal. But I’m not sure what other conclusion I might reasonably reach, given what is happening in America. Two presidents in a row, from “both” viewpoints, argue that opposing them might constitute criminal behavior. Both administrations have argued for unchecked power of the executive. The current president has gone farther than the previous one to crack down on those who expose wrongdoing by the government. (Glenn Greenwald has been documenting how the Obama administration has greatly exceeded the Bush administration in this regard. If you’re not reading Greenwald’s posts on Salon, you should do so. They are well documented and chilling.) The Secretary of State, Madame Clinton, has declared that "citizenship is a privilege, not a right" and that the Secretary of State ought to have the power to strip a citizen of citizenship without court oversight – thus depriving one of access to American courts. "Independent" senator Joseph Lieberman has introduced legislation towards this end. And then there’s the stunt of bring a president of the failed third world narco-state to lecture Congress on "human rights." Mr. Calderon tells us that Arizona’s immigration law, which requires state and local officials to enforce federal law, is a violation of "human rights." And among his solutions is the imposition of strict gun controls. I could go on with the political insanity, but the point has been made sufficiently – the current political clime is one of expanding, without check, the power of the state. All of it promulgates the absolute state. That's indeed fascism, and it is extremely dangerous. This, coupled with the precarious financial position of the American government, is enough. If we do not change course very soon, the American Revolution, the most magnificent political event in history, will be over. And it will be time for a new one. I’m happily ensconced in Montana, hoping that the end of the world is not nigh, as life is quite enjoyable here. I’m working on some projects involving R and training hard in the mountains. The end of the semester was simply too busy for blogging; but now "we" at Unforeseen Contingencies are back in action. Former Secretary of the Interior (under Richard Nixon) and Governor of Alaska Walter Hickel has died. Hickel was a conservative from back in the days when "conservative" meant something other than "fascist" or "religious kook." He supported free enterprise and development, and battled radical environmentalists over these issues. But at the same also understood that we can damage and destroy the environment, and took this threat very seriously. He also opposed the nativism of today's "paleocons" and conservative populists. He was kicked out of the Nixon administration for defending the right to dissent against the draft and the war in Viet Nam. It's hard to imagine where a man like this would fit into today's political spectrum... which helps explain why we are in such a mess today. Walter Hickel, rest in peace.